Edit Syndicate provides 24/7 editing services; our online editors are dedicated professionals who are based in the United Kingdom and who specialize in editing electronic/soft copy documents. Edit Syndicate is committed to providing excellent customer service. Our mission is to offer comprehensive manuscript and book editing services that inserts the appropriate scientific vocabulary needed to describe scientific findings and non-scientific reports. Grammar editing includes the correction of punctuation, verb tense, spelling, and sentence structure. Your document is carefully proofread, ensuring effective communication to your target audience. Editors offer suggestions in terms of style and flow, certifying a well-written document. Edit Syndicate editors observe the same rules of English grammar, punctuation, spelling, style, etc, as traditional editors who work on paper documents. In addition, they improve the vocabulary and sentence structure of the documents on which they work. They also clear up inconsistencies and they attempt to clarify unclear or poorly written sentences. 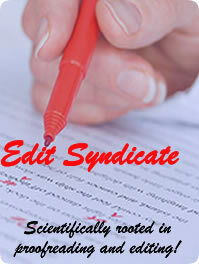 Edit Syndicate editors work on undergraduate and graduate college essays, research studies, and dissertations. In addition, business-related documents, such as contracts, advertisements, proposals, emails, and memos are reviewed and revised by Edit Syndicate editors. The rules of Standard English apply whether a document is printed or transmitted electronically. The main function of Edit Syndicate editors is to ensure that the documents on which they work are clear, concise, and effectively written.